Kaboburritos, a Mexiterranean grill, which is now open, will have a grand opening celebration on Oct. 2. The Market at Liberty Place in Kennett Square will officially be getting two new tasty options this weekend. A grand opening is slated Oct. 2 from 11 a.m. to 5 p.m. for Kaboburritos, a Mexiterranean grill, which is now open. There will be a ribbon cutting at 3 p.m., music by DJ Dre’ Money from 1 to 4 p.m., and giveaways throughout the day. Owner and operator, Carlos Vargas, offers traditional chicken doner kabobs. The meat is cooked on a rotating, vertical broiler, and served on a wrap or pita, with rice or salad. It can also be served on a burrito, taco, or quesadilla. Additional options include beef, pork, shrimp, and falafel. 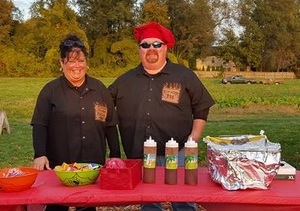 Melissa and Joe Dea, known for catering local events with M n M BBQ, will open a store location at The Market at Liberty Place on Oct. 1. Patrons can also sample a blend of Mediterranean and Mexican side dishes and appetizers, including hummus, feta and olives, pita chips, falafel, pico de gallo, chips, and guacamole. Kaboburritos began in 2010 in Gwangju, South Korea. Vargas and his wife, Stephanie, were living abroad and teaching English. Carlos decided to turn his scooter into a mobile food stand, The Kabob Scooter. Customers lined up every night. He expanded his menu to offer Mexican options and Mediterranean/Mexican appetizers. His scooter was expanded to a small food truck, and a business was born. But that's not the only grand opening this weekend. M n M BBQ, Catering & Smoked Meats is set to open at the market on Oct. 1. The restaurant will offer traditional barbeque items such as ribs, chicken and pulled pork, along with all the side dishes such as potato salad, baked beans, macaroni and cheese, cornbread and more. All items are available at the market or to go. The Liberty Place at Kennett Square is at 148 W. State St. in downtown Kennett Square. The businesses are arranged around the outside wall, with a large space in the center of the room that can hold multiple merchants. There's a climate-controlled outdoor patio, free parking and free wi-fi. The upscale farmers market offers a mix of prepared foods, grocery items, wine and beer, and more. In addition to M n M, The Market is home to Buddy’s Burgers, Yo’R So Sweet, State Street Pizza & Grill, Kaboburritos, Terra Foods (a gourmet pasta and olive purveyor), Punk’d Pineapple (a soft ice cream shop), and Paradocx Vineyard. Another new business, Sugar Daddy's Bake Shoppe, is scheduled to open on Nov. 1. For more information, visit www.themarketatlibertyplace.com. The Market is also on Facebook, Twitter, Pinterest, and Instagram.